The Sto. Niño (Holy Child) is a very endearing image of Christ to Filipinos, historically being the earliest image of Christianity, aside from the cross, to be brought by Ferdinand Magellan when he discovered the Philippines in March 16, 1521. The image of the Sto. Niño was given as a gift to the wife of Rajah Humabon when the couple together with eight hundred Cebuanos were baptized in April 1521. Hence, the Sto. 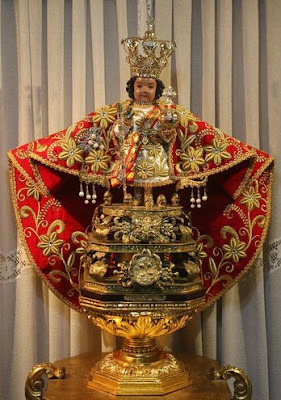 Niño is undoubtedly intricately linked to the Christianization of the Philippines which likewise explains the popular devotion and endearment of the image to Filipinos. Almost every Filipino household would have the image enshrined in their altars, notwithstanding too in some business establishments. Various religio-cultural festivals, notably the Sinulog and Ati-atihan, are celebrated in honor of the Sto. Niño which attracts thousands of pilgrims and even tourists. Because of the exceptionally strong devotion of the Filipino to the Sto. Niño, the Vatican has granted special permission to the Philippine church, to celebrate its feast on the Third Sunday of January. As, we honor the Christ child, we look beyond the fanfare accorded the celebration by delving into today’s gospel wherein Jesus welcomes the little children in his midst, and underscoring the need to be like little children in accepting God’s kingdom. Childish? No. Childlike? Yes. We, thus, look into some characteristics of children where we as adults, can learn from. First, children are straightforward or candid. They speak whatever comes into their minds without worrying what others will think or what others are doing. They are not self-conscious, unlike adults who are worried about social convention. Second, children are trusting and obedient. Believing that others are candid they tend to believe and trust what others tell them, hence, they are likely to obey what others tell them to do. Third, children are dependent. Obviously, they are powerless and have to rely on adults for provision and care. This dependence is concomitant to the trust they have in adults. Lastly, children have a strong sense of wonder. For them, the world is full of surprises and even if they don’t understand things, they get lost in wonder and awe. Even when we become adults we remain as God’s children. Yes--- God’s beloved children-- and as such, we try to imbibe these traits inherent in a child in the way we relate to God. We need to be candid with God, in our weaknesses and pains as well as our strengths and joys. No need to cover-up nor sugarcoat things in our lives. The Lord knows who we are and comes to us where we are. We are called to trust in the Lord and obey Him. While we value freedom and autonomy, let us be reminded the Lord is on our side and wills our well-being. His will and commandments are for our own good, and thus submitting ourselves in humble obedience to Him make us freer and that it is beneficial for us and others. We are invited to depend on the Lord. This doesn’t mean that we would not work and use the gifts and skills he has given us. While we prize self-sufficiency and control over things in our lives, let us remember that ultimately everything depends on God. He cares for us and thus, provides for us. Finally, we open ourselves to God’s surprises--- to His love and power--- and allow it to elicit the wonder and awe in us. May the Sto. Niño obtain for us this childlike faith and move us to love God more deeply by accepting His reign in our lives! Viva Sto. Niño!